This Michael by Michael Kors Grayson Bag is available for the new AW2012 season in shiny white patent leather. The monogram is embossed all over the outside, although it is difficult to see this on the photo. The Grayson is a classic style that is reintroduced by Michael Kors each season. It is a bowling bag shape, with two buckle adjusting pale tan leather top handles with the standard grayson metallic pyramid bases. All the metal hardware on the bag is gold coloured, including the polished MK circle logo handbag charm – which is removable. The bag itself has a top zip fastening. Inside, it has a yellow gold lining and there is a single main compartment, a zip fastening pocket, three slip pockets and a mobile phone pocket. There are feet on the base of the bag to protect it from scratches and it is presented with a Michael Michael Kors dust bag. Elegant in white patent leather, this is a bag, with its golden hardware, that will go with anything. This bag has its own self confident and classic style and is ideal for everyday use. The Fendi Multicoloured Logo Baguette is a light blue and dark blue perforated canvas tote bag, which is trimmed in white leather. The bag has two patent leather white top handles and a Fendi embossed leather plaque on the front. All the white area are made from white patent leather, including the sides of the bag and the trim around the top. The surface of the blue canvas has been treated with a see through film to give it a vitrified appearance. Inside, the bag has a Fendi gold embossed leather label. Measurements: 15.75 ” (40cm) x 13.75″ (34.9cm) x 8″ (20.3 cm); handle drop 6″ (15.2cm). (All measurements are approximate). Great for shopping and days out, there’s no need to sacrifice style for functionality with this Fendi tote. The blue print monogram logo design looks fabulous teamed with jeans, and shopping trips with the girls will give you an excuse to demonstrate your fashionable Fendi credentials. 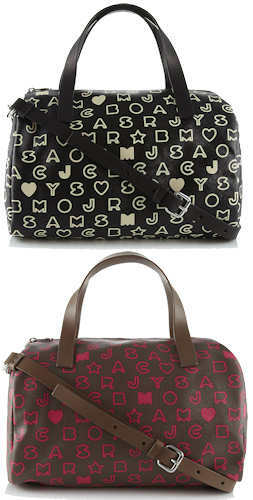 The Marc by Marc Jacobs Eazy Bowling Bag is a logo monogram printed bowling bag in a range of bright colours. It has two leather top handles, a separate removable and adjustable cross body strap and a zip top fastening. The bag itself is made from pvc . It is fully lined with a zip fastening pocket and two slip pockets inside. The colourways available include chinchilla / yellow, hazelnut / pink and black / white. Measurements: 22cm / 8.6″ x 31cm / 12.1″ x 18cm / 7″; all measurements are approximate. 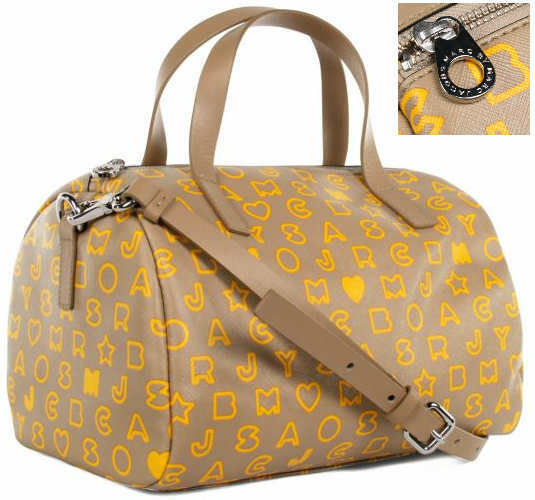 Great for daily use, the monogrammed Marc by Marc Jacobs Eazy Bowling bag is ideal for the summer. It will brighten up any outfit and the range of pretty monogram combos will keep you spoilt for choice. The Michael by Michael Kors Grayson Bag is now available in shiny metallic rose gold (it was already available in yellow gold or silver). The bag features the MK logo monogram embossed all over the outer. It is a bowling bag shape, with two buckle adjusting leather top handles with the standard grayson metallic pyramid bases, although they are in rose gold on this bag. The bag has a yellow gold lining and features the shiny MK logo handbag charm. Inside, there is a single main compartment, a zip fastening pocket, slip pockets and a mobile phone pocket. There are feet on the base of the bag to protect it from scratches. Grab some uptown elegance, New York style, with the rose gold version of the Michael by Michael Kors’ Grayson bowling bag. This is a most desirable and spacious carry everything bag which is perfect for teaming with anything from jeans to a posh frock and it will imbue style to all who carry it. The Fendi Multicoloured Logo Baguette is a cute shoulder bag with the all over double F logomonograms in blue, pink, green, aqua and purple on a cream background. 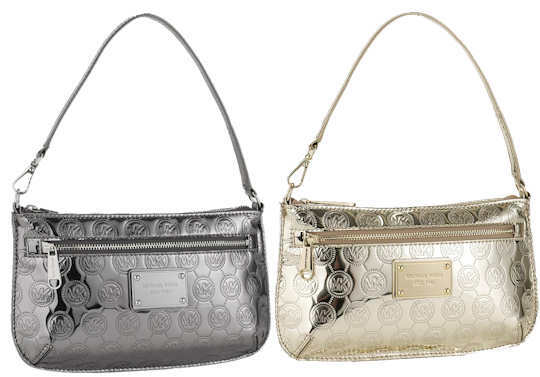 The bag is a flap over style with a magnetic fastening at the front and gold tone double F logo. It has an adjustable leather shoulder strap, and the buckles at each end feature the Fendi branding. Inside, the bag is fully lined and there is an interior zip pocket and a logo label. Measurements: 10.5″ (26cm) x 6″ (15cm) x 2″ (5 cm). (All measurements are approximate). As any fashionista will tell you, the Fendi Baguette is a classic style that is reintroduced season after season, so it never goes out out style. This version with the candy coloured logo print design is particularly attractive and perfect for teaming with prints, plains and colour block designs this summer.